Journey back to 1897 and the Transylvanian countryside of Romania. It was a time of fear and dread for the simple people of this European country. They lived under the dark rule of Count Dracula for many years. He was a ruthless warrior when he was alive, but he was even more terrifying in death! For you see, Dracula is king of the vampires! But even one as powerful as Dracula has enemies. From the early 16th century the Belmonts--including Trevor, Christopher, and the legendary Simon--had been fighting Dracula and his minions throughout Europe. Finally, in 1897 Quincy Morris, a descendant of the House of Belmont, overcame great odds to defeat Dracula and send him to his eternal grave. Unfortunately since Quincy was so badly beaten in his battle with the Count, he lost his own life moments after plunging a wooden stake into Dracula's chest. Quincy's legacy has continued, however. His son--John Morris--and John's childhood friend Eric Lecarde had witnessed the Quincy/Dracula showdown from the shadows. That scene changed their lives forever--as they grew older they swore to rid the planet of the evil creatures of the underworld. Elizabeth Bartley. The name conjures up images of a regal countess who, in the year 1421, was found kneeling over the body of a dead young man. He had two puncture wounds in his neck. She was tried as a vampire and found guilty. Her sentence was... too gruesome to mention in these pages. What is important is that she was indeed guilty. And not only was she a vampire, she was the niece of Count Dracula! Now, in the ruins of a mysterious castle in Transylvania, an amateur witch by the name of Drolta Tzuentes dabbles in arcane magic. She casts a spell which inadvertently brings Elizabeth Bartley back to the land of the living! Now that she has returned, Bartley is bent toward one goal--reviving her dead uncle, Count Dracula! In a twist of fate, Morris and Lecarde have been drawn towards the ominous castle. Their task is simple--defeat Bartley before she can complete her macabre objective. Completing their task, however, will involve many perilous encounters and life-or-death acts of bravado. Is your heart strong enough for this challenge? --From the Genesis Castlevania Bloodlines instruction manual. Castlevania Bloodlines had some major differences from its predecessors. This time, you get to pick from two different Belmont descendants. One, is a guy from Texas with an abnormally large torso. He wields the whip that was passed down from his grandfather. The second Belmont is from Spain. He uses a trident that I think is far superior to the traditional Castlevania whip. There are a couple of reasons for this. First, the trident can be aimed in any direction while the whip is limited to the forward stroke. The trident is also superior due to its twirl technique. This move is a little tricky at first, but once you get it it's not too bad. It comes in handy for a lot of the bosses that like to throw a bunch of little stuff at you. 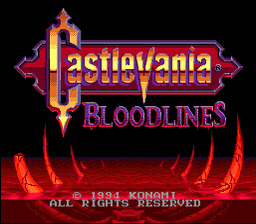 Castlevania Bloodlines was a pretty hard nut to crack, still a lot of fun. If you liked any of the other Castlevanias then try this one! Choose which character you want to play with. Both characters play similarly, with small differences. Morris is the regular Castlevania hero. He's got his whip and can swing off objects with it. Alcarde uses a trident instead of a whip. He can attack in the four cardinal directions, as well as twirl his trident around by pressing A and quickly pressing left and right. If you hold down and press jump, you can spring yourself up with your trident for a super jump! Your life bar is at the top and if it runs out you lose a life. Different enemies will take different amounts of life from you per hit. The stronger they are the more life you'll lose when hit. When you run out of continues press TAB(reset button) and start a new game. You will be where you left off with 2 continues. Before you play, go to the sound test in the options menu. Set the sound effect to 73, the music to 5 and play them. Now whenever you get your third weapon upgrade old school Castlevania music from the NES games will play.